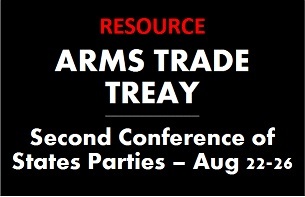 The second annual Conference of States Parties to the Arms Trade Treaty will be held August 22-26 in Geneva where countries will gather during a time of ongoing conflict and controversy over the responsible transfer and use of conventional weapons. Key topics that may be addressed, either formally or informally, include better promoting transparency in the arms trade and arming of Saudi Arabia in light of the humanitarian catastrophe in Yemen. The Arms Trade Treaty (ATT) is the first global accord to regulate nearly all conventional weapons, requiring states to consider multiple criteria in making arms transfer decisions. It entered into force on December 24, 2014, and today has 87 States Parties and 130 signatories. The treaty requires annual reporting -- fewer than four dozen of its members have submitted one this year, some of whom have requested that their report not be made public -- a topic that will be at the heart of the meeting. The United States signed the ATT on September 25, 2013, but has not ratified it. Signature typically obligates countries to not violate the object and purpose of a treaty. Although the Obama administration has indicated that the ATT is consistent with existing U.S. law, opponents have incorrectly argued that it impacts the 2nd Amendment and sought to limit U.S. implementation of the treaty.